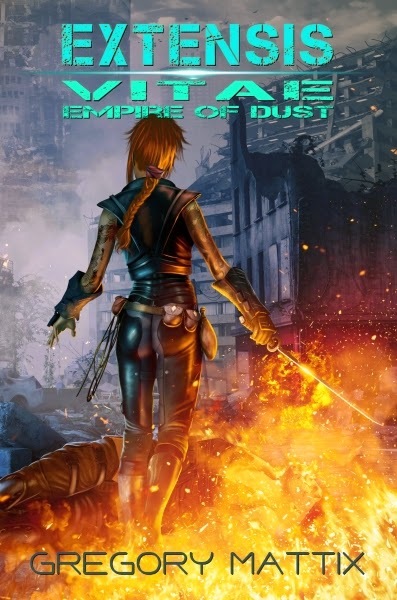 Extensis Vitae: Empire of Dust, the thrilling conclusion of the series, is now available. You can find it at your favorite retailers: Amazon, Apple, B&N, Google Play, and Kobo. Skin City has been liberated, offering a flicker of hope to all who live in the wasteland—hope that times are changing. But it has been a Pyrrhic victory, coming at great cost to the few who remain and seek to carry on the fight. War looms on the horizon as the survivors now seek to take the fight against the overwhelming might of Thorne Industries. Rin Takahashi finds herself thrust into the spotlight at the forefront of the struggle, one she never wanted, yet she feels honor-bound to carry on in memory of a fallen friend. Meanwhile, Marcus strives to save the woman he loves from the soulless corporation threatening to consume them both. And James Mason nears the end of a long road, attempting to make things right after a lifetime in which so much went wrong. These three find themselves in a desperate battle as they seek to topple Thorne Industries in a war that will shake the foundations of the continent. I appreciate your kind remark. Glad to hear you enjoyed the series - thanks for reading! Loved the whole series. I was very disappointed when it had to end. Very memorable characters. And a little bit of everything for the Sci-Fi lover. I'm looking forward to your next sci-fi Adventure. Until then I will try your Venture into fantasy. Thanks for a great read Gregory. I appreciate your generous comments, Lou. I'm glad you enjoyed the series - thanks for reading!